Please welcome Timothy Baker to The Qwillery as part of the 2014 Debut Author Challenge Interviews. Path of the Dead, Timothy's debut, will be published on May 5, 2014 by Ragnarok Publications. Timothy: Thank you. Delighted to be here *looks around for snack comp table*. Back in 2010 when a writer friend enticed me to participate in that year's NaNoWriMo. I had been retired from firefighting for 5 years, had returned to college and took a Creative Writing class, got straight A's, and thought what-the-hell, I'll give a shot at a thirty day first draft. After making the last day deadline at +500 words, and looked back on what my first novel (mess though it was), I figured it might be worth taking a new career chance. I was 54 and looking for something to do, so I got in the writing game. Kind of late in life, I know, but here I am! Timothy: A little of both. For short stories, pretty much panster, that is, when I'm wearing pants at my desk, but that's another tale. I get an idea that trips my trigger and where I want to end it, then sit down and jam it out. The first novel (unpublished) taught me a lot, mostly that I wasn't able to see the big picture. So the next novel, Path of the Dead, I made a rough chapter outline of the story, marking the set pieces, then pants'ed my way through the parts in between. It was good to know where I was going and seeing chapters ticked off, but leaving open places where I could let my imagination free. Timothy: I'm a relatively slow writer, mulling over things for long periods before I commit to the chair. I envy those writers that post their FB status with, "I wrote 35.2 bajillion words today on my new novel. Now I can get to work on the 5 short stories and novella I'm working on for tomorrow's deadline!" I also hate them. Who else is with me on this? Timothy: I'm an old dude and was raised on comic books, fantasy/horror/ SF/pulp adventure fiction. Stan Lee, Poe (everything), Lovecraft (mythos stories), Edgar Rice Burroughs (Tarzan and John Carter), Rod Serling (everything), Ray Bradbury (The Dark Country), Arthur C. Clarke, Tolkien, Anthony Burgess (A Clockwork Orange and The Wanting Seed blew my mind), those I would say were my early influences. Later came Stephen King, Clive Barker, Neil Gaiman, and the writers I put on my highest pedestal: Cormac McCarthy and Elmore Leonard. TQ: Describe Path of the Dead in 140 characters or less. Timothy: Damn zombies, can't get away from them, even in Tibet. They'll follow you up a mountain just to snack on you. TQ: Tell us something about Path of the Dead that is not in the book description. Timothy: It's short and it has a big kitty in it. TQ: Why did you set the novel in Tibet? Timothy: The story was written with a Buddhist POV and Tibet is steeped in it. And Tibetan Buddhism has a huge mythology to mine, with gods and demons and shape changing monks, and has been influenced by the indigenous Bon religion, which is somewhat animistic, and nature born. Nature is one of the running themes in the story and it allowed me to broaden the fantasy aspects of the narrative. TQ: Path of the Dead is a blend of dark fantasy and horror. What inspired you to write a dark fantasy / horror story? Timothy: It's been said to "write what you know" and I have fifty years of dark fantasy/horror books and films in my head that have created nightmare ideas, twisting around like snakes, needing to escape. I write dark fantasy/horror because it's what I know--and to remain sane. TQ: The book description mentions a "plague of apocalyptic proportions" resulting in the dead rising - the undead. Are your undead Zombies or something else? Timothy: Oh, they're zombies, for sure, the classic Romero zombie. I didn't want to recreate the wheel, only take the genre where it hasn't been. TQ: What sort of research did you do for Path of the Dead? Timothy: Of course, lots on Tibet in general: the history, terrain, flora and fauna. And being a Buddhist student from way back, I had to go back and reread some of the Tibetan mythology and pull out their sutras (teachings) to reference. 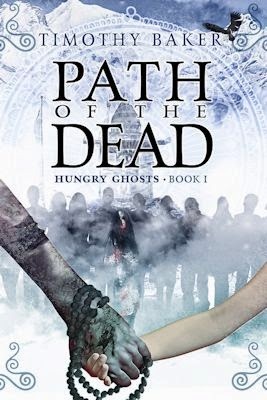 TQ: In Path of the Dead: Who was the easiest character to write and why? The hardest and why? Who is your favorite good 'guy', bad 'guy' or ethically ambiguous character in Path of the Dead? Timothy: Easiest would have to be the female nun, Gu-Lang. She doesn't speak, so dialogue was easy for her, only facial expressions and body language. She's a soldier of sorts, a skilled fighter, an easy read when she's communicating her emotions. Very direct. The hardest was Chodren, my young (10 years old) protagonist. Getting in his child's mind and keeping it consistent without over playing it, was a bit tricky to navigate. Definitely my favorite was my main protagonist, Dorje, the Shoalin trained monk. A 'good' guy through and through, he's complex, torn, doubtful, contemplative, confident, and driven. And he can fight like the characters in an old, Chinese, kung-fu movie. TQ: Give us one or two of your favorite non-spoilery lines from Path of the Dead.
" All distilled down into a monster of infinite size, pure in its vengeful message, one in its endless clouded eyes, countless arms with grasping hands, and the gnashing teeth, driven by one singular desire—hunger for the flesh of the living." "The panther seemed to accept his point and wandered off to find prey with lesser debate skills." Timothy: Well, I'll be starting on Hungry Ghosts Book Two. And of course, more short stories (I love writing them) and I have a couple of novel ideas in mind: Dark Country, a story of a country Sheriff and a serial killer occupying the same county where strange things take place; and a yet to be titled story of a young man coming back to his old small town to live in his dead mother's old abandoned house, and three witches that wander the grounds disguised as cats. Timothy: No, thank you. It's been a great pleasure. Now where's the snack comp table? 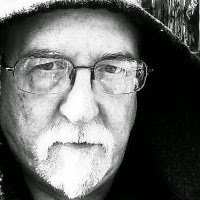 Timothy Baker is a retired firefighter and an aspiring, perspiring, horror writer. He is published in Fading Light: Anthology of the Monstrous by Angelic Knight Press, and the forthcoming Midian Unmade: Tales of Clive Barker's Nightbreed from Tor. Tim has also received a commendation in the Australian Horror Writer’s Association 2009 Short Story Competition.